Do you have some burning questions about fundraising? Find all the answers below! I want to fundraise for Alzheimer’s Research UK. How do I get involved? We’re so grateful you’ve decided to join the fightback against dementia. Whether it’s running, cycling, swimming, walking, remembering someone special or fundraising in the workplace we appreciate your support. You can find a whole host of ideas in our #IFightDementia fundraising guide, or if you’d like to speak to someone to find the fundraising activity that’s right for you contact us on fundraising@alzheimersresearchuk.org or speak to a member of our team on 0300 111 5555. Which fundraising event is right for me? There are so many ways you can get involved – why not take a look at our upcoming events for some inspiration? If you’re not sure what’s right for you, drop us a line on fundraising@alzheimersresearchuk.org or speak to a member of our team on 0300 111 5555. Can I speak to a local contact? Yes! We have a fantastic team of regional fundraisers based across the UK. Each of our Regional Fundraising Officers manage and live in their regions and are here to support you with your fundraising. Select your local area here and get in touch today! Can I organise my own event for Alzheimer’s Research UK? Absolutely, you can fight dementia however you like! Maybe it’s a bake sale, a baked bean bath or even a body wax. You can find lots of ideas and inspiration here. If you’re thinking of organising your own cycling challenge or mammoth run, then make sure you let us know here so we can send you your free #TeamARUK fundraising pack and t-shirt! I have my own place in an event, can I still support Alzheimer’s Research UK? That’s no problem! Make sure you register your event here and we’ll send you your #TeamARUK fundraising pack, containing everything you need to get started. An online fundraising page is a great way to tell people about what you’re doing to defeat dementia. It makes it easy for people to donate and it’s a great way to update people on your progress. Head to JustGiving or Virgin Money Giving and follow the instructions. Make sure you select Alzheimer’s Research UK. (Please note, we’re listed on many other fundraising websites so if you have a preference you should find us on there!). Personalise your page with photos, and add a message about why you’re fundraising for us. Remember, every pound you raise brings us closer to defeating dementia. Shout about it! Send your friends, family and colleagues a link to your page, post it on Facebook and tweet it. Watch as the messages of support and sponsorship roll in. Online fundraising sites are an easy and secure way of allowing people to sponsor you. You won’t need to chase anyone for money, as the funds get sent directly to us from the site. If you are fundraising through your workplace, please click here to see which online fundraising page you should use! By creating a giving page through your company’s chosen fundraising page, it will automatically count towards your employer’s fundraising total. It will also add you to any leaderboards if you’re competing with colleagues. Go on, sign up individually or create a team! 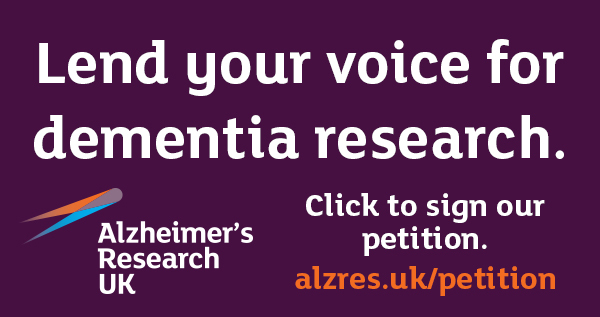 Send an email to corporate@alzheimersresearchuk.org if you have any questions. How much of my donation does Alzheimer’s Research UK receive? Your donations are important to us and so it is important for us to ensure you know exactly how much money we receive from your donation. You can make sure we get the most out of your donation by asking those who sponsor you to ensure they tick the Gift Aid box, if they are a UK taxpayer. Gift Aid means that we receive 25% more than taxpayers donate (so if you or your friends give £10, the charity gets £12.50). It is also worth considering which fundraising site works for you as there are several to choose from with different benefits and fees. You can find a full breakdown of the top fundraising sites and their fees here. How can I advertise and promote my event? You’ve done the hard part…now shout loud and proud about your event! Social media is a great way to share your fundraising page or set up an event. We also have a social media toolkit! From cover images to profile pictures, you can find all you need to customise your social profiles here. Why not contact your local newspapers for advertisement, put up posters in your area, contact local websites and post on community forums too? I would like some fundraising materials for my event, where can I find these? From collection pots to our orange t-shirts, we have loads of fundraising materials available for you to use at your event. Make your order today here. How do I pay my donations in? Online: You can pay your donations via our website here. Your Fundraising Page: Do you already have a fundraising page set up? You can always add your donations on yourself. BACS: If you would prefer to pay via BACS, please send us an email to fundraising@alzheimersresearchuk.org and we will provide you with your unique reference. If you are fundraising through your workplace, please click here to see ways in which you can pay in. Paying your donations this way ensures that your fundraising is linked to your employer’s fundraising total! What happens if I don’t reach my minimum target for an event? Minimum sponsorship amounts are put in place to ensure we offset our investment in the entry costs, allowing us to fund the best research as quickly as we can. In the worst case, the charity may lose money from that event place if the minimum amount is not raised and in some cases, you may not get to take part in the event. There is no legally binding contract if the minimum pledge is not met and you would not be required to make up the difference, however we cannot stress enough the importance of hitting your target! For every £1 donated, 85p powers our research and helps people to understand and fight dementia. The remaining 16p raises our next £1 and funds essential running costs. We fund pioneering research that will make a real difference to people’s lives – now and in the future. Read more about our strategic approach to research, our exciting big initiatives and search through some of our pioneering research networks and partnerships. Find out more here. Find out more about how your fundraising helps by taking a look at what your amazing fundraising can pay for. If we were unable to answer your question, please do contact us at fundraising@alzheimersresearchuk.org or speak to a member of the team on 0300 111 5555. If you are fundraising through your workplace you can email corporate@alzheimersresearchuk.org or call 01223 896605 to speak to a member of the Corporate Partnerships team. Are you associated with the Alzheimer’s Society? Alzheimer’s Research UK is the only dementia charity working across the UK with a sole focus on funding pioneering research. Our singular focus on research means we can channel all our expertise and energy on powering the breakthroughs that will make the greatest difference to people with dementia and their families today and in the future. Our mission is to bring about the first life-changing dementia treatment by 2025 and with your support, we’re funding the scientists that will take us there. Alzheimer’s Research UK receives no government funding for our research, so everything we are able to achieve is thanks to our incredible supporters doing amazing things to raise money for our research. More people are joining #teamARUK every day, and we would love you to be one of them. You can read our latest Annual Review here. Alzheimer’s Society is a separate charity that provides dementia care services and initiatives, as well as funding for biomedical and care research. In 2016/7, around 9% of their funding was channelled into advancing research, with 59% going towards meeting the needs of people with dementia. Their Annual Review is available online here. As Charity of the Year for the 2019 Virgin Money London Marathon, Alzheimer’s Society and Alzheimer’s Research UK have joined forces for the Dementia Revolution. This special year-long campaign aims to overthrow old attitudes to dementia and raise millions of pounds for the most ambitious dementia research initiative the UK has ever seen, working to find better treatments and a cure – the UK Dementia Research Institute. You can find out more here. How can I volunteer for Alzheimer’s Research UK? Volunteers are a vital force in our efforts to defeat dementia. Becoming a volunteer can take as much or as little time as you like. Whether you can spare a few hours collecting in your local supermarket, or a full day cheering at one of our cheer stations, there is a volunteer team waiting to welcome you. What is the Dementia Revolution and how is Alzheimer’s Research UK involved? As Charity of the Year for the 2019 Virgin Money London Marathon, Alzheimer’s Research UK and Alzheimer’s Society are joining forces for a special year-long campaign to make a stand against dementia.